LOS ANGELES, California (CNN) -- Music producer Phil Spector, on trial for the second time in connection with the 2003 death of an actress at his home, is "a very dangerous man," a prosecutor told jurors Monday. 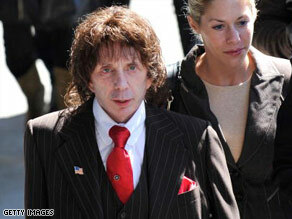 Phil Spector's retrial in the 2003 slaying of actress Lana Clarkson is winding down this week. The victim in the case, Lana Clarkson, was "a murder waiting to happen," deputy district attorney Truc Do said in closing arguments. Spector, 69, is charged with second-degree murder in Clarkson's death. The 40-year-old actress was found dead of a gunshot wound through the roof of her mouth in February 2003, at Spector's Alhambra, California, home . The prosecution concluded its closing arguments Monday. Defense closing arguments are set to begin Tuesday. Jurors could begin deliberating by the end of the week. At Spector's first trial, jurors were asked to decide whether he was guilty of second-degree murder. At the retrial, they will be given the option of deciding whether he is guilty of a lesser homicide charge. "Spector has a history of playing Russian roulette with women -- six women," prosecutor Do told jurors Monday. "Lana just happened to be the sixth." She said the music producer moves in a "VIP world," but that behind the VIP front, Spector is "a very dangerous man" who believes women deserve "a bullet in their head." A mistrial was declared in Spector's first trial in September 2007. After deliberating for 15 days, jurors were unable to reach a verdict, telling Superior Court Judge Larry Paul Fidler they were split 10-2. An unnamed court official told CNN at the time that a majority of jurors voted for conviction, and jurors said two holdouts believed the defense's assertion that Clarkson's death could have been a suicide. In the 2007 trial, Spector's attorneys argued that Clarkson was depressed over a recent breakup and grabbed a .38-caliber pistol to kill herself. Clarkson starred in 1985's "Barbarian Queen" and the 1987 spoof "Amazon Women on the Moon," but was working as a VIP hostess at Hollywood's House of Blues at the time of her death. Several people identifying themselves as Clarkson's friends testified for the defense, portraying her as a suicidal has-been despondent over her failing career. At the retrial, prosecutors worked hard to refute that portrayal of her, calling her mother and a suicide expert to the stand. Do told the jury that it was very important to consider Spector's pattern of gun assaults against five other women. It shows that Clarkson "absolutely" did not "commit suicide in this case," the prosecutor argued. Do added that Clarkson spent her last day alive shopping with her mother before work. She bought eight pairs of shoes, and Do said it is hard to believe that any woman with so many new shoes would "then go out and commit suicide." At both trials, prosecutors painted Spector as a gun-toting menace. Several women took the stand to tell harrowing stories of Spector threatening them with firearms. Spector's second trial began in October. Fidler ruled on Friday that jurors can consider the lesser charge of involuntary manslaughter against Spector, but Do reminded them they must unanimously agree that Spector's actions do not amount to second-degree murder before considering the lesser charge. The evidence, she said, shows "this case is nothing less than second-degree murder." If convicted of second-degree murder, Spector could face a prison sentence of 15 years to life, according to the Los Angeles County district attorney's office. A conviction on involuntary manslaughter could bring a prison sentence of up to four years. Spector arrived at court Monday wearing a long black coat. His wife, Rachelle, dressed in white, was on his arm. The gallery was filled with media, family and curious onlookers. Clarkson's mother, Donna, sat in the front row with her daughter Fawn, Lana Clarkson's younger sister. Spector has won two Grammy Awards and was inducted into the Rock and Roll Hall of Fame in 1989, but he stayed out of the public eye for two decades before his 2003 arrest in Clarkson's death. CNN's Paul Vercammen contributed to this story.